This is another item that’s in the system for roughly 2 years. But it has more supporters than the previous item. The vote count when I started writing this post was 115. What I like is the interaction on this item, there are 37 comments on the subject. Granted, most of them are rant’s but Janell has a good work around solution that helped a lot of people. March 2019: 314 votes and 91 comments (this is GREAT guys!) it’s on top of the list now. Why would multiple instances improve the product? I figured out a workaround–doesn’t give you another Project screen but allows you to show multiple projects next to each other within Project. Open the projects you want to compare and first click on Project’s main “full screen button” (looks like a little square or double square on the top right next to the close x) make it just a single square. This will allow you to change the screen size to anything you like (I pull mine to be as big as both of my monitors). Then, right below the Project’s main ‘full screen’ tab click the lighter gray double square tab on the individual project to make it a single square. Then drag the top title bar of the top project a little to the right or left to separate it from the other projects below. You can then resize and drag the individual project screens within project to be next to one another. You’ll need to make the other projects the same size and not overlap or if you click one, it will cover the smaller one and you have to start over. Hope that helps. This is the only way you can have two side by side schedules to this date. Which is really a shame because you cannot compare schedules the way you can compare Excel sheets and Word documents. There is a Compare Projects feature, that will help you compare a current project file with a previously saved project file. This can be interesting to explore. The problem is that you are unable to compare with a completely different schedule, where you just want to compare WBS or certain sections. With this implemented you will be able to make full use of a duo screen situation, most desk workers have this. Janell has a nice work around, but the split screen will pull the ribbon across screens, making some comments nearly impossible to navigate. Apart from the obvious improvement there, it’s crazy to think that most of Microsoft’s desktop applications allow for this multiple screens option. But Project is clearly left out here. For this second item I’ve asked Prasanna Adavi to give his opinion on the subject. We know Prasanna from his MS Project Podcast, his own blog, and he spearheaded the Project Virtual Conferences 2015 & 2018. 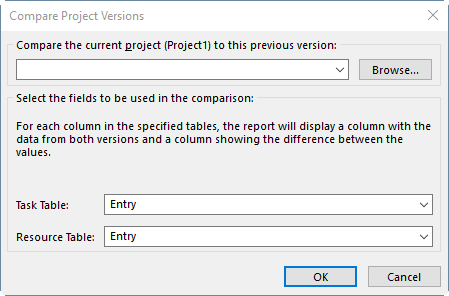 Imagine you have two excel spreadsheets you have been asked to compare with one another. In a blink of an eye, you would open both of those excel files at the same time, in two separate windows and go about your task. What seems so obvious feature for rest of MS Office does not seem to hold true for Microsoft Project. As of the time of writing this, the ability open two Microsoft project schedules in two separate instances side by side is glaringly missing. The closest you can get to this functionality is to use the “Arrange” feature which arranges the schedules you have open vertically or horizontally. However, this still happens within the same window, so technically you cannot move each project into its own instance for comparison purposes. The side by side window feature has many applications including flexibility in comparisons, copying, printing and so on. While this seems too simple of a feature to complain about, it is one of those things that you prevent you from moving fast and being productive with the tool. There is a reason why all other office products have been carrying this feature for a while now. Granted, MS Project files are not as simple as a word document or excel spreadsheet. There is MS Project Server connectivity to worry about and also the Shared Resource Pools, Resource Leveling features that pose additional complication in making the side by side opening of the files work. One thing to remember is that the Project team, just like any other high efficiency team works on prioritized list of requirements. They depend upon UserVoice, and telemetry data to see which features are being requested the most and try to fit them into their work plan. So, if you really want this feature implemented (or any other), the simplest way is to vote for it on the UserVoice and make it rise to the top. Now, if you feel the same way as Prasanna and me, please head over to the item and vote on it. It’s that simple, and it will help Microsoft Project users all around. In the very least it will trigger a response from Microsoft. I’ll update this post as more information comes available. Great post, Erik! I think Prasana captured it well when he said the inability to open multiple instances prevents us from going fast and being productive. So true! Thanks for raising awareness to this Uservoice suggestion. I’m glad you liked the article Joe. Happy to help. It would be nice I’ll agree Erik, but to explain one of the things that makes this tricky – it is the shared hidden resource pool that happens in the background when you have projects open – even when connected to Project Server or Project Online. It isn’t quite as straightforward as the document model that Word and Excel have. Obviously not impossible – but not as easy as you might think either. Hi Brian, great to hear from you here! And thanks for explaining some of the background of why this is difficult to achieve. Let’s see if the vote count goes up a lot to give you insight if it’s worth spending the effort. For me, the vote counter said enough (just like with the people picker custom field ).